For centuries, wedding rings and the process of creating a dream ring has been a topic of conversation primarily reserved for brides-to-be. Grooms often select from a handful of generic band options, their biggest decision coming down to two or three precious metal options at best. Traditionally, wedding rings for men were timeless and fairly simplistic with little room for a personal touch. In recent years, the grooms of the world have spoken and a shared desire for more wedding ring options and thus, the demand for gentlemen’s custom wedding rings is on the rise. As wonderful as it is to celebrate your future bride with a ring she will treasure for a lifetime, choosing your wedding band should be a personal process as well. For both spouses, the weddings bands are a powerful symbol of their love and lifelong commitment to one another. The beauty of this bond should be embodied in a wedding ring that is as much a treasure as the relationship it represents, and one that fits your style and personality. Custom ring design has opened the door for men to explore endless designs for wedding bands. When you decide to custom design your ring, there is almost no limit to how creative you can be. Whether you’re drawing inspiration from a celebrity style, your future spouse’s wedding band, or your imagination, nearly anything is possible. Utilize various precious metals for a multi-tone look or incorporate diamonds for a luxurious touch; engrave a special phrase on the inner surface of the band or add some vintage flair. You are free to be as creative as you want and design a ring that is a wearable work of art. No two grooms are alike, so why would anyone choose a one-size-fits-all wedding band? When you create a custom wedding band, you can choose a style that will live up to design preferences and the demands of your lifestyle, whatever those may be. For example, perhaps you work with your hands and need something extremely durable precious metals like titanium and black titanium hold up well under daily wear and tear are virtually indestructible. For many grooms, comfort is of utmost importance. Slim band designs eliminate any extraneous bulkiness or weight for a barely-there feel, but still makes a statement style-wise. 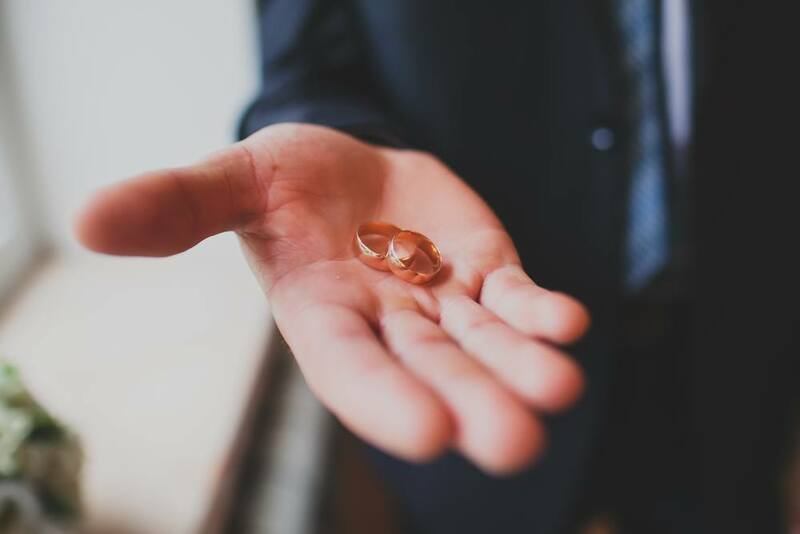 One of the most popular reasons that grooms and brides alike choose to design their own rings is because it affords them the ability to include family heirlooms. In some cases, a family ring has been handed down through generations and the customization process can allow you to create your version inspired by the piece. In other cases, a gemstone that has been handed down through the generations carries significant meaning and needs a band that honors the stone appropriately. When you customize your wedding ring, you can incorporate family heirloom pieces in a way that stays true to your style. A custom creation can combine both family history and modern designssomething nearly impossible to find outside of the custom design process. You probably would not wear the same shirt as thousands of other men, so why choose a generic ring style? A wedding band is something you will be wearing for a lifetime, so it is important to pick something that’s special to you. Imagine how much more meaningful a custom ring will be once it is infused with your personality, style, and creativity. It will truly be unlike anything else in the world. Every groom has a different personal style which is why the custom ring design is ideal. You may have a minimalist style, or perhaps you appreciate a generous dose of eye-catching gems. Whichever path you choose, you can rest assured that your ring will be absolutely one-of-a-kind. When it comes to something as delicate and meaningful as wedding jewelry, it is important to select a reputable jeweler that you can trust. At Dominion Jewelers, we have the expertise and skill to craft the kinds of wedding rings that will accompany you through the journey of a lifetime with your spouse. Our jewelry designers will collaborate closely with you to bring a vision to life, ensuring absolute perfection down to the last detail. Using the world’s finest precious metals and gems, we will create a piece deserving of the honored place on your left hand. To learn more about our custom jewelry design process and your options for creating a personalized wedding band, contact Dominion Jewelers today. Call Us Today With Questions!